The weekend also saw the first of the US qualifiers for the 2014 Ironman World Championship taking place in Madison, Wisconsin. 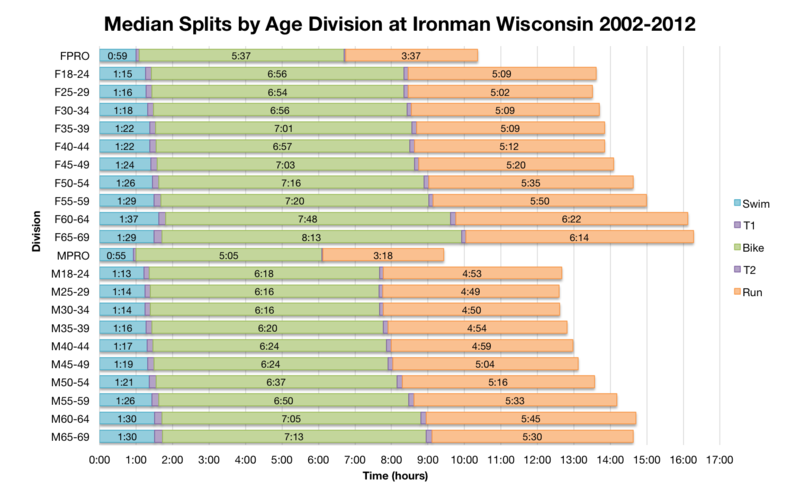 Ironman Wisconsin is a long standing event with 10 years of results available on Ironman.com for comparison. 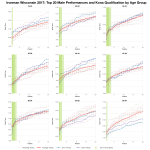 It draws a large field each year, but falling close to Kona will tend not to attract those who’ve qualified that year. Results tend to fall inline with those seen at other North American races. It’s clear from the split distributions above that 2013 closely followed the pattern of previous events. The only exception is the swim where times were slower; possibly the consequence of choppy conditions. After that bike, run and overall splits are remarkably similar to previous events. So overall a very by-the-book year in Wisconsin. 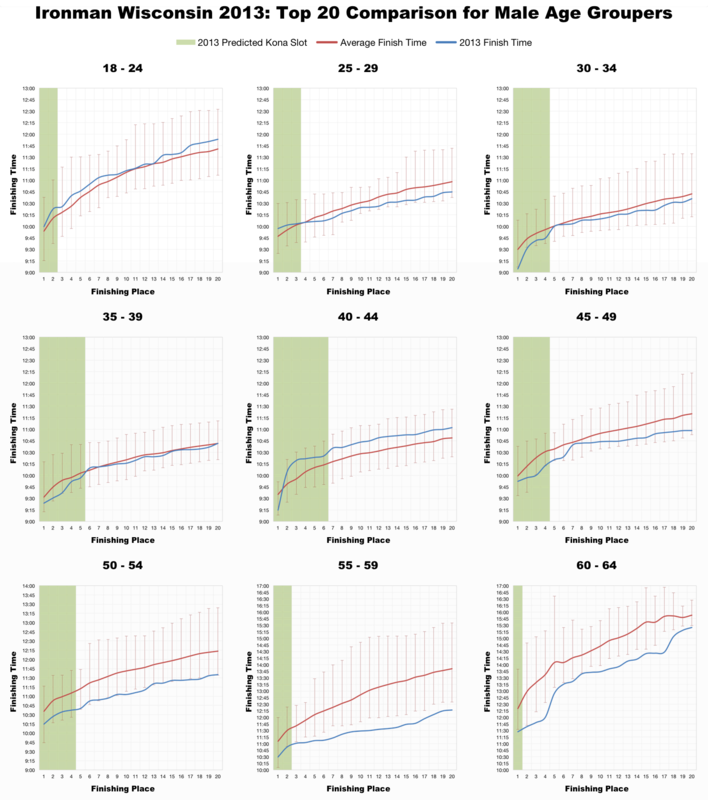 Comparison of the medians confirms the slower swim, but the picture for bike and run is more mixed. 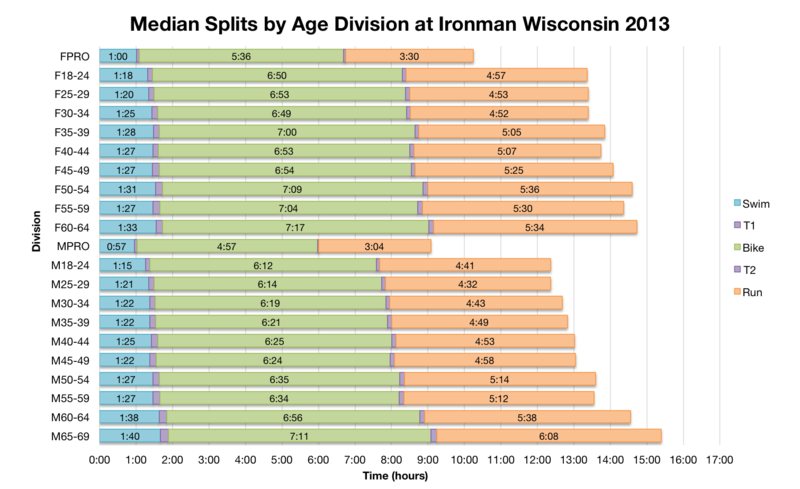 Many age divisions were on average faster this year in both bike and run. 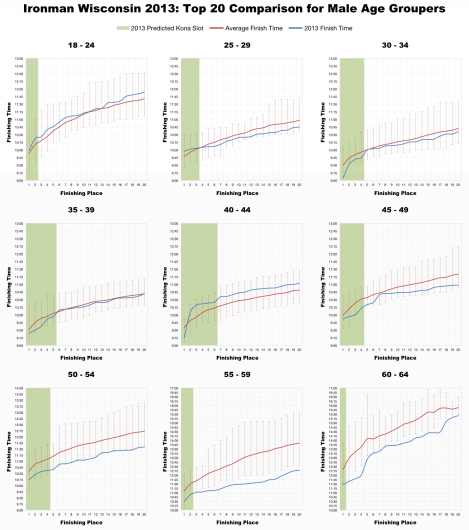 What seemed like small variations in the split distributions prove to have a bigger influence at this level. Swim aside Wisconsin my have been subtly faster than usual – reexamining the bike distribution shows that there were fewer athletes at the very slowest end of the field for example. There is no sign of a Kona qualifiers list for Ironman Wisconsin yet, so unfortunately the list released for Ironman Japan may have been a one off. For the purposes of this post I’ll stick with my estimates from my pre-race analysis. Comparing this year’s top twenty performances with the past gives another mixed picture. 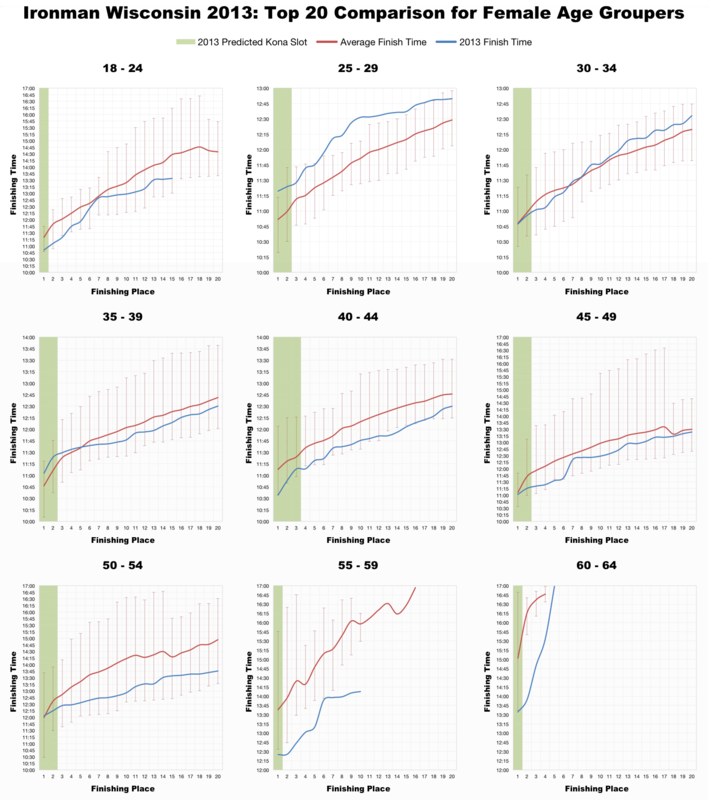 Older age groups appear to have performed well with the over 50s in both genders generally outperforming the average. 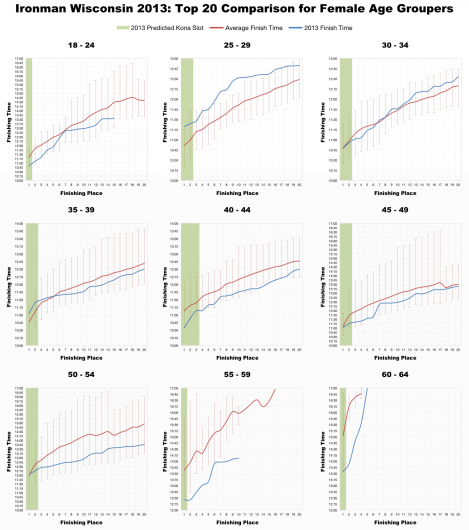 Below 50 and the results tend to lie closer to the average with some categories faster and some slower. Certainly no consistent pattern and in most cases results fall within the range of previous races. From this perspective the averages proved a reasonable guide to the qualifying times that were required. After a tougher than usual start Ironman Wisconsin largely stuck to form for the rest of the day. 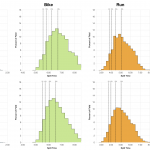 Times may have been slightly faster than usual for bike and run as indicated by the medians, but the shift in the overall race is small. 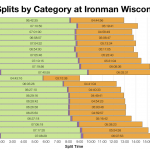 I’ve uploaded a spreadsheet of the full results and splits from Ironman Wisconsin 2013 to my Google Drive.